Unfrozen Studios has announced today that the Kickstarter for their upcoming title Iratus: Lord of the Dead will be going live on May 22nd to raise $20,000. The turn-based roguelike RPG allows players to play as the villain, the necromancer Iratus. Voiced by S Weyte (Fire Emblem: Path of Radiance, Mario Party 8, Blood and Metroid: Other M) the revenging Lord of the Dead is hell-bent on raising his army to take over the world. 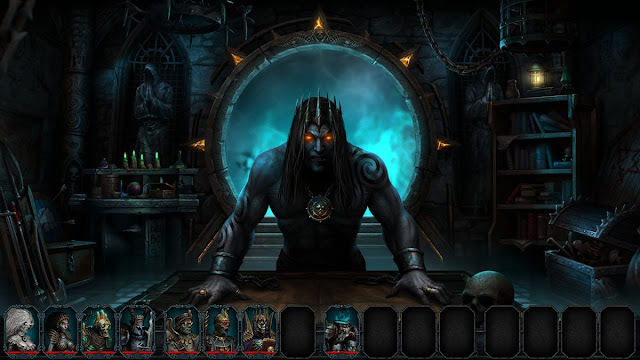 Not for the faint of heart, Iratus engages players in a tactical dungeon-crawler, where players collect the body parts of their fallen foes and use Iratus’s mastery of the necromantic arts to grow their army. Players can craft minions with different stats and abilities depending on the ‘ingredients’ selected allowing players to fine-tune their undead army. The roguelike RPG tests player’s tactical prowess against the denizens of the living, using alchemy and magic to empower Iratus’s loyal minions including skeletons, zombies and vampires. While the minions are the frontline grunts in battle, players can use Iratus himself to change the tide. By spending mana, players can use iratus to cast spells onto the battlefield to strengthen his minions or weaken his foes. Using Iratus’s dungeon as a base, player’s are able to embark on ever-changing battles, that will require players to use all of Iratus’s abilities and minions in order to achieve victory and replenish the necromancer’s supply of useful “items”. The dungeon is also where players can hone the skills of Iratus, craft additional and more powerful minions and choose their preferred methods of battle. Iratus: Lord of the Dead will hit Kickstarter on May 22nd will be available on Steam early access in August.